Welcome to the 5G Learning Center. Here you will find a variety of educational content focused on multiple aspects of 5G technology, design and test. The content on these pages is updated frequently, so please check back from time to time for updates. Expert lecturer, Andreas Roessler, has compiled a collection of short videos on key 5G technology topics to get you up to speed quickly. 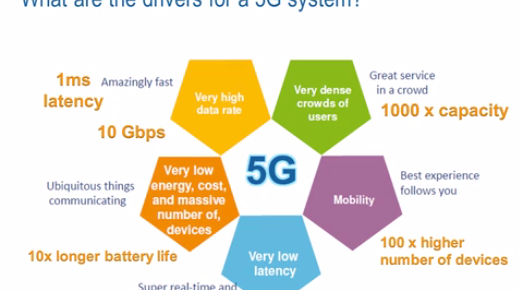 In this video series, expert technology lecturer Reiner Stuhlfauth provides you with a short but detailed overview of 5G timelines, applications and key technology aspects. Future 5G communication systems operating in the mmwave bands (6-100 GHz) will rely on multi-antenna techniques like beamforming and MIMO 1. Therefore, measurement and description of spatial channel information (direction of arrival DoA, direction of departure DoD) is of high relevance for mm-wave system design and channel modeling. 5G technology for cellular networks is investigating the use of signals with bandwidths up to 2GHz. This application note presents a method to measure and analyze signals with an instantaneous bandwidth of up to 2 GHz using new tools on the FSW Signal and Spectrum Analyzer platform in collaboration with an RTO Digital Oscilloscope.